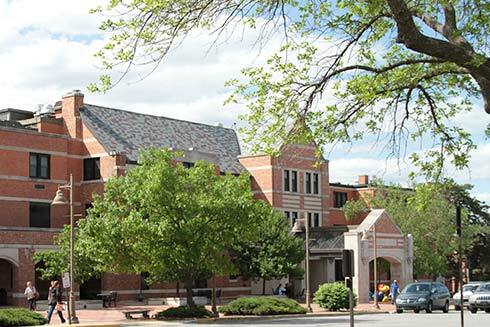 All sessions for the Fall 2014 Midwest Economics Theory and International Trade Meetings will be held at the University of Kansas Memorial Union, 1301 Jayhawk Blvd., Lawrence, Kansas. The Kansas room (located on the 6th floor of the Kansas Union) shall serve as the registration area and a central meeting place. Volunteer graduate students shall be there starting at 1 pm on Friday, October 17, to help with registration, distribute welcome packets, and answer questions. In each presentation room, there is a laptop with basic software (Microsoft Office and Adobe Reader) and a projector. Wi-Fi shall be available as well. From Kansas City International airport (MCI), visitors typically either rent a car or take a shuttle (www.gtslawrence.com) to Lawrence. The two main conference hotels are Holiday Inn and The Oread. Holiday Inn is about 2.5 miles from the Kansas Union. It is an easy drive but a somewhat long walk. For visitors staying at the Holiday Inn, we have organized a limited bus service (details are given below). From the Oread, it is an easy walk to the Kansas Union. Paid parking is available in the Mississippi Street parking lot, adjacent to the Kansas Union. Street parking is typically free on Saturday and Sunday, but please check parking restrictions posted for particular areas. You are warmly invited to the conference reception and dinner on Saturday, October 18, 5:30 pm – 8:00 pm, at the Spencer Museum of Art (located near the Kansas Union). The evening begins with an introduction by Saralyn Reece Hardy, Director of the Spencer Museum. All galleries are open for conference participants; you may explore on your own or join one of the tours offered at 6:00 pm, 6:30 pm, and 7:00 pm. Moreover, KU piano student Kai Ono shall be performing on the Museum’s famed Bechstein piano, commissioned by Franz Liszt. The conference has arranged limited bus service for visitors staying at Holiday Inn. The buses are operated by First Student, according to the following schedule. 1:00 pm Depart Holiday Inn for Kansas Union. Bus returns immediately for one more trip. 6:15 pm Depart Kansas Union for Holiday Inn. Bus returns immediately for one more trip. 8:00 am Depart Holiday Inn for Kansas Union. Bus returns immediately for one more trip. 8:15 pm Depart Spencer Museum for Holiday Inn. Bus returns immediately for one more trip. 1:00 pm Depart Kansas Union for Holiday Inn. Bus returns immediately for one more trip.